This is a stunning plant, Lilium nepalense with its dramatic large flower, yet a rather small bulb, also known as the Nepal Lily, this one is native to the Himalayas through to China and Burma. Sometimes this is said to be a plant that is a little 'difficult' in cultivation, however if you follow a few basic growing and care tips Lilium nepalense are usually very happy. Very large flowers with maroon throats, the colour of the bells or trumpets, vary a little but 'lime green' to a 'yellow green' is the best description. The stems will reach around 1m with the flowers hanging downwards. When you are determining how to grow this rare bulb, consider that Lilium nepalense are from an area where drainage is excellent, and cultivation seems logical. They do not like to be wet from autumn through winter, otherwise they will just rot. Secondly they are stoloniferous, which means that the bulb sends out underground runners, and new bulbs form a distance away from the original one. So although you know where you planted it, Lilium nepalense can pop up somewhere else, usually within 100 - 200cm, just far enough away for you to slice it in half with a spade or garden fork without knowing. Find a position where the soilis deep and ample light is available, avoid a position that is wet or poorly drained in autumn and winter. Planting depth of around 8 - 10 cm works for us. So the main problem or issue is the growing stem itself, it likes to go for a little 'wander' before emerging, easily cut off if you go digging around to close to where you 'think' the bulb might be. So taking all of that into account, find a well drained position in part shade, morning sun and then dappled shade is ideal for Lilium nepalense. These bulbs do come from an altitude, so cooler climates are best suited. You could try growing these in a large pot or container, although as the growing stem is a bit of a wanderer as well it might just find its way out of the bottom of the pot. 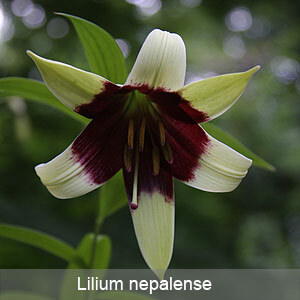 So use a big container for Lilium nepalense. A little variation in flower colour occurs with L.nepalense robusta having much larger and also greener flowers than the species. Propagation from seed is fairly easy, the flowers are pollinated by bees and insects and as they are hermaphrodite you only need one flower. Cover lightly with grit and leave outside over au tumn and winter in a cold frame. Sow thinly and leave in the pots until they are two - three years old. Pot up after 2 - 3 years into single pots and leave for another year, again a good rich potting mix. Plant out after 4 years. It will take a few years to flower from seed.